1986 Audi Coupe GT - I've always liked these cars and don't understood why they don't get more recognition than they do. The GT Coupe didn't come with Audi's quattro system (the similar looking and very spectacular UR Quattro did), but with a 5 cylinder engine, they were equal to or better than many of the coupes coming out of Japan at the time. They also looked better (unique) than anything coming from Japan at the time. This Coupe GT is in very nice shape and has been well maintained. Located in Crosslake, MN, click here to see the eBay listing. 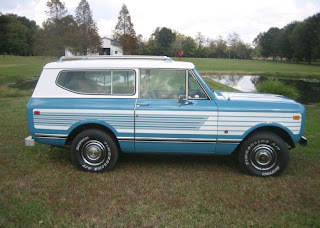 1978 International Harvester Scout - Until I see one, I forget that IH made "civilian" SUVs (although that term had been coined yet) right up until 1980. They were a lot like the Jeeps they were competing with. They were old school and tough. This is a 33,000 mile unrestored Scout. It has the IH 345ci V8 in it. This is a really cool looking vehicle. I don't know for how long I could live with the plaid seats, but a couple of seat covers would hide them and keep the original upholstery in good shape. Located in Baton Rouge, LA, click here to see the eBay listing. 1948 Studebaker Land Cruiser - I know next to nothing about old Studebakers. I'm posting this because I found it while doing a search for a Toyota Land Cruiser for a friend. I had no idea there was another vehicle called a "Land Cruiser" before the Toyota SUV. Now, when someone asks you what you think of the Land Cruiser, you can be a jackass like me and ask, "The Studebaker or the Toyota?" Located in Prescott Valley, AZ, click here to see the Craigslist ad. Studebaker used the Land Cruiser model name from 1934 to 1954. 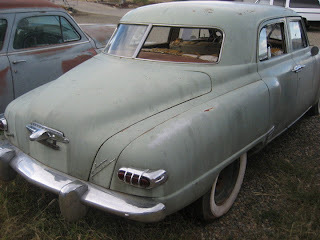 Like most of their work (including"Studebaker") they didn't trademark it. 1934-1936 they were fastback "streamline" bodys, after they were long wheelbase four door sedans, never with small engines. Most often with top line interiors as well. Post war they were the largest cars Studebaker offered. I’ve only had one IH over the years. A 67 Travelette- Crew Cab pick up. So many IH are beat and used up. Mine was a rust buck with a Chevy 327. I actually have been poking around to see what other may be out there as Navistar/IH is based here in Chicago. I can across a few at work and it’s sparked my interest. That’s ridiculous amount of money for a Scout. Yes is has 33k miles and original. There was a similar Scout with less that 1000k miles listed about 6 months ago on eBay that did not approach that $ amount.